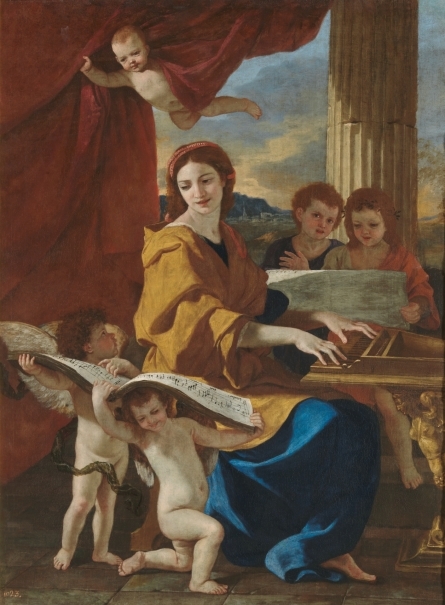 Cecelia, patron saint of music, sits before a harpsichord that rests on a pedestal conceived as a sculpture, reading a score held by two child angels. She is wrapped in ocher robes that partially hide her blue tunic. Behind her, two young singers read another score while, in the upper left corner, the fifth figure, a child, raises an ample curtain whose mass is balanced by a column. 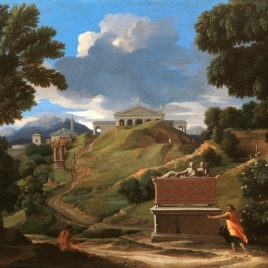 The background is a broad landscape under a cloudy sky. Cecelia, a virgin and martyr, must have lived during the 2nd or 3d century after Christ. Her basilica in Rome’s Trastevere neighborhood contains her relics, which are considered genuine. She made vows of chastity, even after marrying Valerianus, the Roman nobleman who baptized her. Her patronage of music is based on the story of her life. Tradition has it that, at her fiancé’s house, she heard the sounds of musical instruments but was not distracted from her permanent thoughts of God, whom she invoked in her heart. 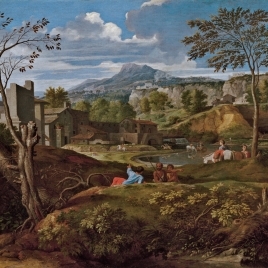 The attribution of this work to Nicolas Poussin was formerly questioned -some historians attributed it to Charles Mellin- but today no one doubts its authorship, although the master may have made it in collaboration with assistants from his studio. It has been dated from before the Martyrdom of Saint Erasmus (Rome, Vatican Museums), a spectacular canvas that is probably somewhat later. 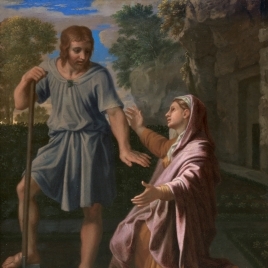 The saint’s face appears in other paintings by Poussin from this period or slightly earlier, including the Holy Family with Saint John and Saint Elizabeth (Moscow, Puskin Museum) and the Mystical Marriage of Saint Catherine (Edinburgh, National Gallery). 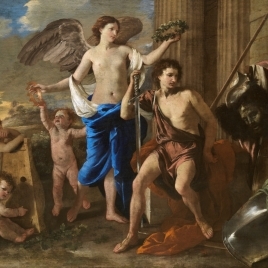 Poussin’s Immaculate Conception and two different depictions of Saint John were supposedly sent to Spain by Marcantonio Borghese. 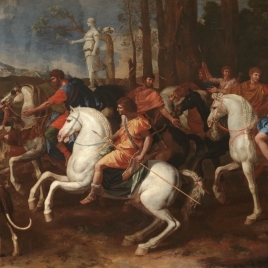 Were they every found, they would make it possible to establish a solid basis for the undoubted attribution of the painting to Poussin. This painting of Saint Cecelia as of great quality, firm execution, confident drawing, refined color and compositional elegance. 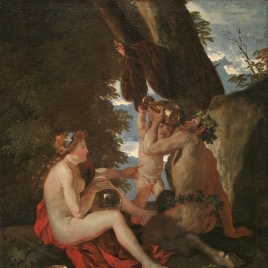 Nothing is known of its history before its mention in the inventory of Madrid’s Alcázar Palace in 1734, so it may have been acquired by King Philip V, who purchased various works by Poussin on the European art market, particularly in Amsterdam. Some of those works belong to the Museo del Prado (Text drawn from Luna, J. J.: El Prado en el Ermitage, Museo Nacional del Prado, 2011, pp. 106-107). Height: 117.7 cm. ; Width: 89 cm. Royal Collection (New Royal Palace, Madrid, "pieza de comer la serenísima infanta", 1772, n. 334; Royal Palace, Madrid, "dormitorio de príncipes-pieza décima", 1814-1818, s.n. ).